ItalyPokerDeals customers will benefit from Lottomatica VIP rakeback, which is presented below, in the VIP System section of our Lottomatica review. New accounts are also eligible to a 100% up to €950 Welcome Bonus and to various promotions. 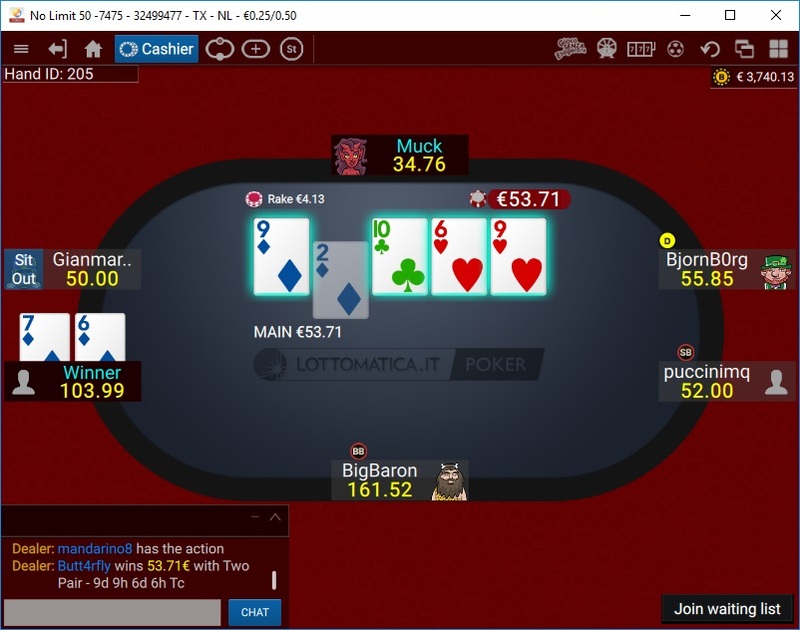 Non-Italian players who are not allowed to register Lottomatica accounts are kindly asked to get in touch with ItalyPokerDeals team to discuss alternative options! Lottomatica is offering a 100% up to €950 Welcome Bonus, released in €2 installments and which has a rakeback equivalence of 25% and a validity of 90 days. 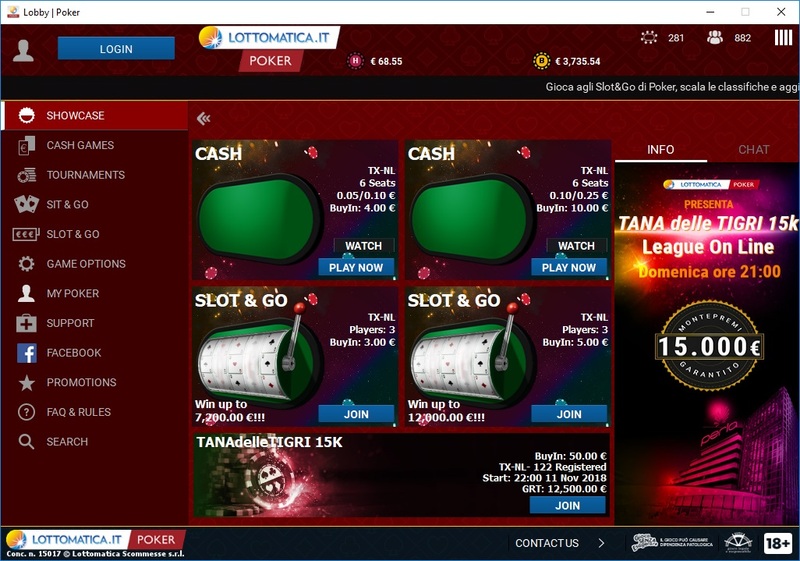 In order to receive Lottomatica Welcome Bonus, you need to register your account using the link we provide, choose the bonus amount during registration procedure, make the first deposit and then start playing for accumulating the Poker Points required for bonus release. When playing real money games in Lottomatica, you will earn 40 Poker Points for each €1 rake you generate. Lotto bonus is released in €2 tranches for every 320 Poker Points you earn, therefore the bonus is equivalent to 25% Lottomatica rakeback. Points balance can be checked any time in the "Profile" section under "Welcome Bonus" tab of your Lottomatica account. In the table below you will find the various bonus amounts you can get in Lottomatica, according to your deposit and the Poker Points amounts required for releasing each bonus. Status Points are collected at the following rates: 1 SP for each €0.01 rake generated in cash games and 1.5 SP for each €0.01 rake paid in tournaments (SNGs and MTTs). SP determine the VIP level you reach. Premium Club is made of 8 VIP levels for Poker: Bronze, Copper, Cobalt, Silver, Gold, Platinum, Emerald and Diamond. Lotto accounts are set by default to Bronze level after registration. This level requires 5000 Bonus Points in order to release a €1 bonus. Each Lottomatica VIP level is asigned a multiplier, which applied to the Status Points will result into Bonus Points. In the table below you will find the levels of Lotto VIP System, the Bonus prizes you can get from it and the required number of Bonus Points for the realease. In the table below you will find the requirements and the gross rakeback equivalence of Lottomatica VIP system, calculated for the rake generated in cash games. How to get your Lottomatica rewards? In order to cash in your bonuses from Premium Club, you need to access your account on Lottomatica website, then go to "Profilo" (Profile) / "Premium Club". In the page that opens you have to click on "I Tuoi Premi" (Your Prizes) tab and then request the bonus you want from the list. How to maintain your VIP level? The only way of maintaining a VIP level is by constantly playing real money games, because reaching a specific level doesn't mean you won't be demoted to a lower one. You have to maintain constant the earned Status Points average, which translates into generating constant rake volumes. Technically, the levels are maintained when at least one of the 3 moving averages returns that specific level value. A moving average is a succession of averages derived from successive segments of a series of values. Lottomatica uses the 7 - 30 - 100 days moving averages. You will be automatically assigned the most profitable level based on the comparison between the level reached by each moving average. Slot & Go Tournaments - A SNG variation with random prize pool. In order to bring money to your account, you have the standard Skrill and Neteller ewallets, but also options like PayPal, PaySafe card, bank transfer, credit card and the specific deposit methods like Lottomaticard (via PayPal), OnShop recharge and Lottomatica recharge. Skrill and Neteller deposits can be made with amounts between €30 and €950 per transaction and the default maximum amount is €4000 per week, but this can be increased by request. For cashing out, Lottomatica is offering Skrill, Neteller, PayPal, Visa Cards, PaySafe Cards, Lottomaticard, Wire Transfer and Point of Sale. In order to be able to withdraw, the account must be validated and this requires you send front and back side of your identity document. Skrill withdrawals have a maximum of €10000 per transaction while Neteller only €1000 per transaction and they are usually processed in 1-3 working days. In the table below you have all withdrawal methods offered by Lottomatica and a few details about them. Lottomatica rake calculation method is Weighted Contributed. No rake will be charged before the flop and in case of unmatched bets. In specific cases, tables which do not charge any rake are offered by Lottomatica. In the table below you will find Lottomatica rake structure, including the maximum amounts charged by the room from the pots (rake cap). Lottomatica belongs to International Game Technology group (IGT) which is offering gaming and betting services in more than 100 countries around the globe. Lottomatica is offering Sports Betting, Casino, Lotto, Poker, Bingo, Skill Games and FantasySport. It's poker section is also known as Bossmedia.it Network. If you need to contact Lottomatica you can do it via Live Chat (requires being logged in), via email using the address supporto@lottomatica.it and phone at 800.900.009. Trackers support is available, so you will be able to record statistics using Holdem Manager and Poker Tracker, but you need to use a hand grabber because hand history files are not automatically saved. 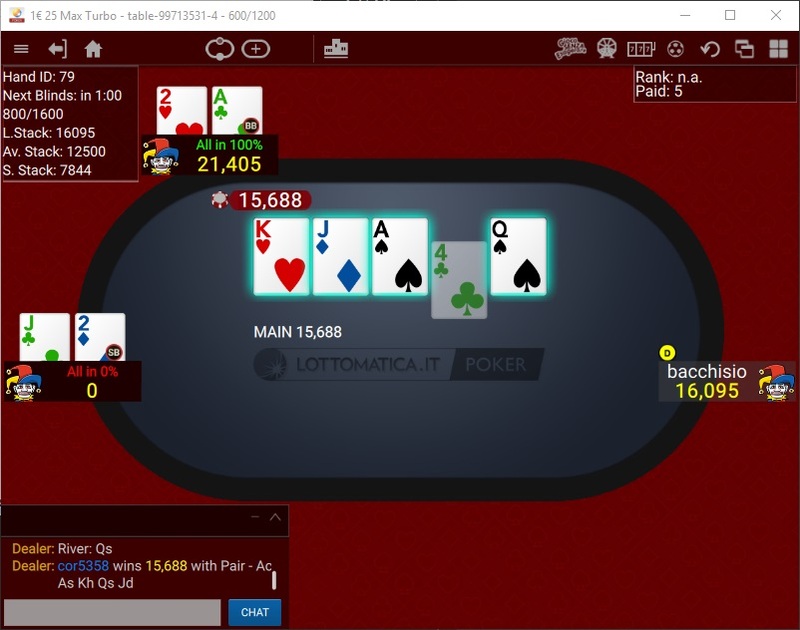 Lottomatica is also offering a mobile website version besides the desktop one and poker apps for both iOS smartphones and tablets and Android devices. 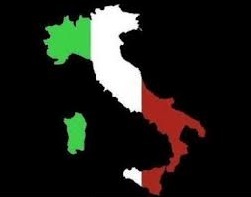 Italian IP VPN is required if Lottomatica account is accessed from outside of Italy. 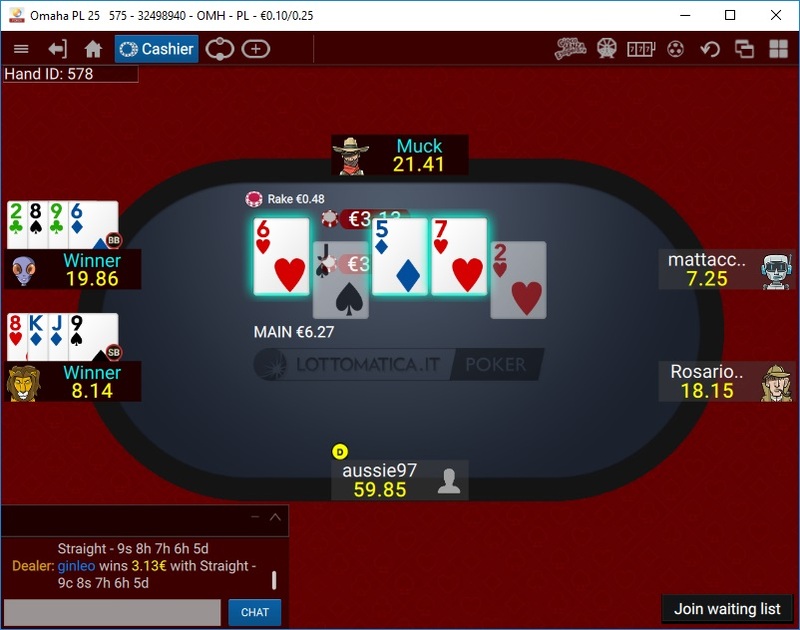 Lottomatica poker client can be downloaded and installed without being required to log in the website and all tables from all games offered are visible in the lobby. But in order to open a table to check the action, you need to log in. 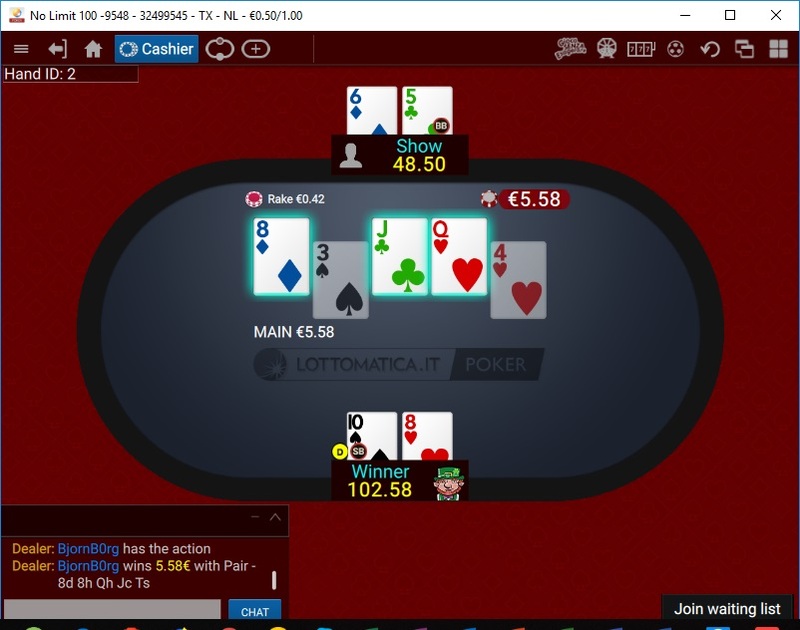 Lottomatica is a decent option for PLO players, with action at low and medium stakes and even e better one for NLHE customers, who can find action up to higher stakes games. Games are pretty soft, similar to the other Italian networks, with many recreational players at the tables. Lottomatica rakeback which can go up to 55% if you constantly play on this network is a big advantage compared to other networks.